The year's greatest celebration is almost here! 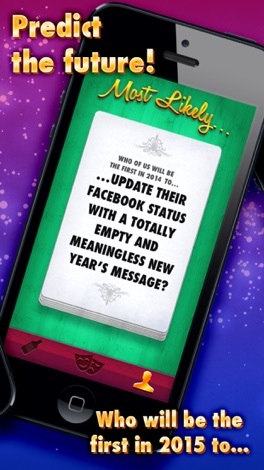 And here's the app guaranteed to get the party going! Get ready for the best night of the year! Time to look ahead! Guess who in your crowd will be the first to make out with a colleague next year? Be thrown out of a club? Or will Instagram pictures of themselves? Find out how well you know your friends! 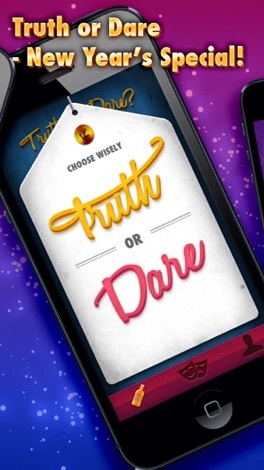 TRUTH or DARE - NEW YEAR’S SPECIAL! FREE - BUT THERE'S MORE! 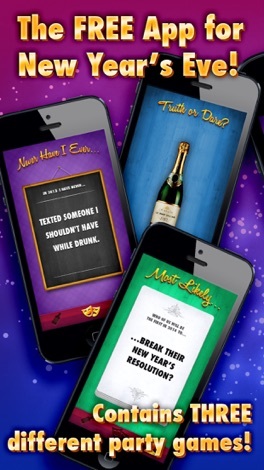 The New Year’s App is completely free and includes a trial version of each game. If you get caught up in the games and want to play more, you can easily unlock the app for only $2.99 and receive access to all content and get rid of the ads! - Customized games for the most important party of the year! - GREAT content! THREE different GAMES with hundreds of fun and exciting questions and challenges! - Extremely easy to use! - It's totally FREE! Try without (economical!) risk! - Stylish design that makes it fun to use! - Share questions and challenges on Facebook or via email! Do people dare to participate online? NOTE! This is NOT a game for a family party. And no matter how you play, we take no responsibility, whatsoever, for any consequences. STARSS is a News Reader featuring a futuristic interface experience. STARSS provides convenient access to all your favorite news and blog sites via RSS feeds with classic design, animation, and sounds. STARSS is a Universal App, which runs on iPad, iPad Pro, iPhones, and features full support for Retina Displays. When a game starts, 2 numbers are indicated. Please judge which number is big, or judge equal. And push the button GT or LT or EQ. You have 30 seconds for play. However, When 2 numerical totals are 13, You have to push the button XIII. If you get 13, you catch bonus & more time. Time won't be more than at most 30 seconds.